This was our plan….we put up a fake listing about a guy proposing to his girlfriend online. The date of the fake proposal would “coincidentally” be around the same time that the couple would be in town. David showed the listing to Kate and suggested they participate, and she bit! I worked with Tony at BILLINGS DANCE CENTER and his crew created a video with the choreography. It was sent over, David & Kate practiced, and she was all in. Essentially, we were planning a flash mob in a flash mob. We planned a rehearsal the morning of, even though the dancers already had everything nailed down. But in order to really fool her, David & Kate showed and up we practiced the routine. There was a fake groom (“Damon” who was dancer), and he played the part of the nervous proposer perfectly. Then, we breaked for Damon to pick up his girlfriend and David took Kate to lunch. Everyone was to come back and act casual at Cathedral Park (some picnicked, some tossed around a ball, some played with a dog, etc). During the break, Kate & David’s family showed up and we hid them up high at the park so they could see everything. Kate’s sister and her family came straight from the airport and were stuck behind a train so we were super nervous they wouldn’t get in place without being seen! Luckily we got everyone in place, the time came for Kate & David to return and the weather held. The music began, they hopped on stage and started their routine right on cue. Halfway through, the choreography changed and all the dancers circled around Kate & David. She was clearly confused and then shocked when the “bride” (a dancer!) ran up on stage to join the dance and David got down on his knee. It was such a thrill to watch it all happen and my heart was pounding! 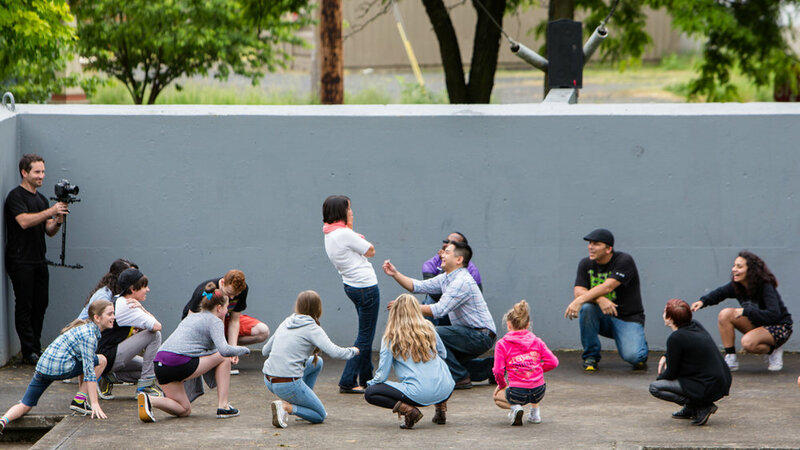 After the proposal, the dancers kept performing as family walked down the hill. Kate’s eyes got bigger and bigger as she saw all of her close family who traveled from all over the country make their way to her. It was such a special day, and such a special group of people. I had the best time planning this! Even more exciting? We are planning this sweet couple’s 2015 Portland wedding!